Fujitsu today announced that it has received an order for the large-scale massively parallel supercomputer system “Oakbridge-CX” from the Information Technology Center of The University of Tokyo. The new system will achieve a theoretical peak performance of 6.6 petaflops(1) by clustering 1,368 next-generation Fujitsu Server PRIMERGY x86 servers that feature Intel® Xeon® Scalable Processors. Leveraging the technologies and expertise based on its track record of building and operating supercomputer systems for a wide variety of customers in and outside Japan, Fujitsu is working to build the system with the aim of beginning operations in July 2019. Since its establishment in 1965 as the Computer Center of The University of Tokyo that specializes in shared use of large-scale computing by researchers in Japan, the Information Technology Center has been using supercomputers to advance cutting-edge research in science and engineering. At the same time, the center plays a core role in the Joint Usage/Research Center for Interdisciplinary Large-scale Information Infrastructures (JHPCN) and it has contributed to R&D in a wide range of fields, including the natural sciences, engineering, and the social sciences by providing computational resources to High Performance Computing Infrastructure (HPCI). The new system is also expected to be used for field trials designed to create data utilization platforms with a vision of achieving Society 5.0(2). 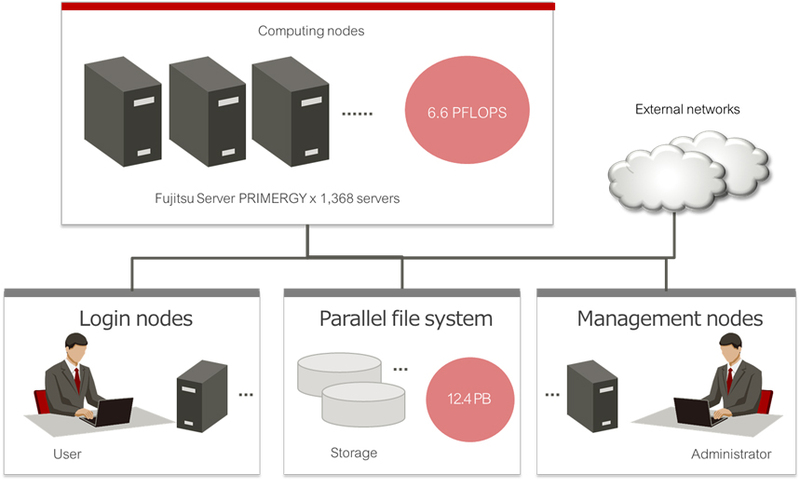 By developing and offering high-performance supercomputers, Fujitsu will continue to contribute to the advancement and use of such technologies as computer science, simulations, data utilization, and AI. Short for peta floating point operations per second. Peta is an SI prefix indicating one quadrillion, or 10 to the power of 15, indicating performance of one quadrillion floating point operations per second. A human-centric society that delivers both economic development and resolutions to societal issues through systems that fuse cyberspace (virtual spaces) and physical space (the real world) at a high level. Fujitsu is the leading Japanese information and communication technology (ICT) company, offering a full range of technology products, solutions, and services. Approximately 140,000 Fujitsu people support customers in more than 100 countries. We use our experience and the power of ICT to shape the future of society with our customers. Fujitsu Limited (TSE: 6702) reported consolidated revenues of 4.1 trillion yen (US $39 billion) for the fiscal year ended March 31, 2018. For more information, please see www.fujitsu.com.